Mānā is a coastal plain with an ancient sea cliff at its inner edge, which extends from Waimea in the south to the north on the western shores of Kauaʻi. Throughout prehistory, large areas of the Mānā Plain were covered by the great Mānā wetlands, allowing native Hawaiians to canoe as far south as Waimea. The Legend of Barking Sands suggests there was an old Hawaiian fisherman who lived in a hut near the beach with his nine dogs. During his fishing trips he would tie his dogs to stakes in the sand, three to each of three stakes. He would then get into his canoe and go fishing. One day while he was at sea and the dogs were tied as usual, he was caught in a very bad storm. For hours he battled the heavy seas until he was finally able to return to land. He was so exhausted that he crawled to his hut, forgetting to untie his dogs. When he awoke the next morning and went outside, the dogs were nowhere in sight. All he saw were three small mounds of sand where the dogs had been tied. As he stepped on one of the mounds, he heard a low bark. Another step brought another bark; he still couldn’t find the dogs. Believing the dogs had been buried in the sand because of the storm the day before, the fisherman began to dig. As each shovel full was removed, more sand took its place. He finally gave up, and every day after that when he crossed the beach he could hear the low barking. The dogs were never found, and to this day the sands of Mānā have been known as Barking Sands. The scientific explanation of these sounds from the sands is that the grains of Mānā sand are tiny, hollow spheres. When rubbed together, the give off a popping sound similar to the barking of dogs. This only occurs when the sand is very dry. Wet sand gives off almost no sound. Up until the mid-1880s, the great Mānā wetlands, east of the plain, covered large areas of the lowlands. Approximately 1,700-acres of permanent, semi-permanent and seasonal wetlands were present on the Mānā Plain. After the arrival of Europeans to the island, aquaculture transitioned to agriculture through the eventual draining of the wetlands and the cultivation of sugar cane and rice. One of the first European settlers, Valdemar Knudsen, drained a portion of the Mānā wetlands be excavating a ditch through to the ocean a Waiele. The first sugarcane was planted in Kekaha in 1878. PMRF is a test and evaluation facility for Ballistic Missile Defense programs. It is the world’s largest instrumented multi-environment range capable of supporting surface, subsurface, air and space operations simultaneously. There are over 1,100-square miles of instrumented underwater range and over 42,000-square miles of controlled airspace. In 1921, the land area known as the Barking Sands was acquired by the Kekaha Sugar Company. This area became a runway for private planes. In 1932, Australian pilot Kingsford Smith completed a historic flight from Barking Sands to Australia in his Ford Trimotor. In 1940, the US Army acquired the land, naming the installation Mana Airport and paving the runway. In 1941, the Army acquired additional acreage, giving Mana Airport a total of 2,058-acres. Private airlines frequently utilized the airport and during World War II there were a great deal of military flight operations there. In 1954 the base was officially designated Bonham Air Force Base. The US Navy’s first began operations at Bonham in 1956, testing its Regulus I missile. Soon after, in 1958, the Pacific Missile Range Facility was established in order to support the growing demand of the Navy at Bonham. In 1964, the Pacific Missile Range Facility and Bonham were transferred to the Navy, becoming Pacific Missile Range Facility, Barking Sands. 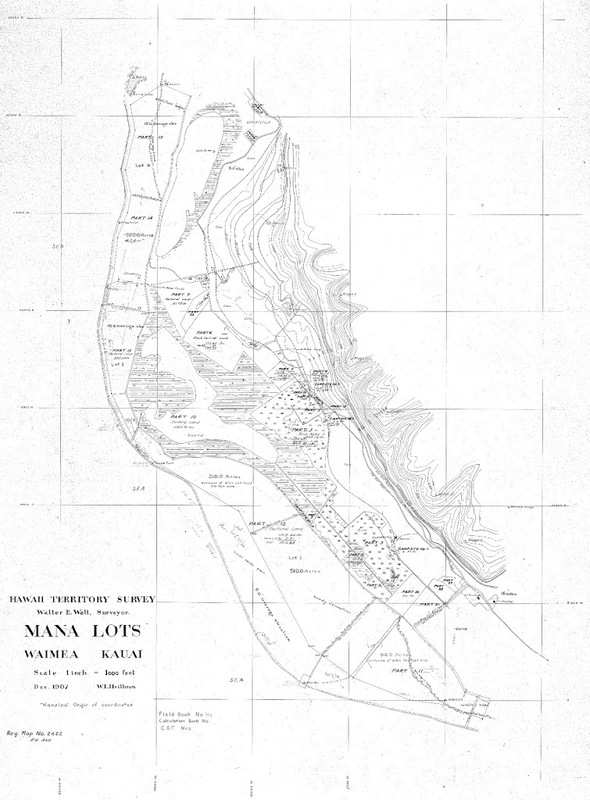 The image is a 1907 map of the region of Mānā and the surrounding wetlands. In addition, I have added other related images in a folder of like name in the Photos section on my Facebook and Google+ pages.